Kamala beach is a perfect spot for a diving holiday on Phuket. Imagine a diving holiday on Phuket, and you no doubt conjure up images of dazzling white sand beaches and colourful traditional boats set against the sparkling turquoise blue of the sea and the lush green of the hills. You envisage running from your hotel room straight on to the beach and plunging into the sea immediately. Enjoying some of the best dive sites Phuket has to offer. And in the evening you picture yourself sitting with your feet in the sand as you enjoy your meal, with only the sound of the waves to interrupt your conversation. But for many visitors, the reality can be different. The view from your room is blocked by high-rise buildings; the road between your hotel and the beach is jammed with polluting traffic – especially worrying for parents; the boom-boom of discos blare into the night. This is the price Phuket pays for its popularity. At Kamala Beach, you have the best of both worlds – you will find the gentle, relaxed way of life the island used to enjoy, yet it is easy enough to taste the more raucous and commercial side of Phuket life when you want. You can best get an impression of Kamala versus Patong and Kata / Karon beaches from a trip at sea. While Kamala Beach presents a picture that is predominantly green, interrupted by the pale gold of the sand and handfuls of low-rise buildings, the other resort beaches are tangles of buildings, many monolithic and others reaching to the sky. The sea is packed with jet-skis and motor boats. Kamala’s beach stretches for 2km and many of the hotels and guesthouses front right on to it. Restaurants and bars are on the beach – so your chair is in the sand, and so are your feet! 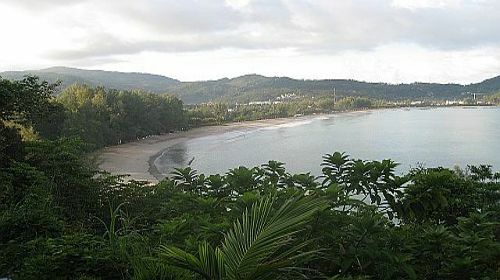 The main road, which connects Kamala Beach with Patong and Kata / Karon to the south and Surin beach and the airport to the north, runs through the village, but is 500m away from the beach, unlike at the other resorts. For most of your stay, you won’t even know it is there! But it offers useful facilities such as supermarkets, pharmacies, banks and a post office. The small road that runs down to the beach is quiet, with no speeding traffic, and here you will find Merlin Divers, along with cafes, restaurants, pharmacies, souvenir and tailors’ shops, convenience stores and several ATM machines. It’s a great place for a mid-morning coffee and pastry before hitting the beach. Watersports are available on the beach, but disruption and noise are kept to a minimum. Restaurants, whether in the village or the beach, offer variety, from simple Thai noodles, to sizzling seafood, and a selection of international dishes including steaks, pasta and pizza. For drinks, there is a range of bars, mostly low-key and the atmosphere is friendly and welcoming. If after a few days of chilling on Kamala Beach you want to experience more of the island, it’s easy to get around thanks to its location in the centre of the west coast of Phuket. There’s Phangna Bay with its dramatic limestone rock formations, including ‘James Bond island’ – take a leisurely boat cruise or a more active kayaking trip. Wat Chalong is the pride of the island and its most stunning temple; nearby is the 45m-high, hilltop Big Buddha. Promthep Cape offers spectacular sunset views. Further afield, you can take a daytrips by boat to the Phi Phi islands for snorkelling, fishing and, of course, diving. In fact, all the area’s dive sites including Racha Island and the Similian Islands are easily accessible. And if you really want to shop seriously, then Patong with its designer boutiques, Thai furnishing and souvenir shops and department stores is only 15 minutes down the road. The same goes for its varied and high-octane nightlife; not just the myriad bars but Muay Thai boxing and cabaret shows, too, and almost any cuisine from around the world – transport is easy to arrange throughout the night. Then there’s Phuket town for its markets, cafes and restaurants, and shophouses. And the airport is just 40 minutes’ drive away. Kamala Beach has something for everyone. Families will find the sea gentle enough for kids to play in, and the lack of traffic near the beach also ensures peace of mind. Couples can enjoy a relaxed nightlife, walks along the beach at sunset, and a quiet sun lounger during the day.